Donated to Mission Beach State School for their annual fete (the Banana Festival). The painting was auctioned off through 'salBay' during the day and was eventually sold for $360 (all profits going to the school). The local lady who's final bid was successful is well aware of the bargain she bagged on the day. 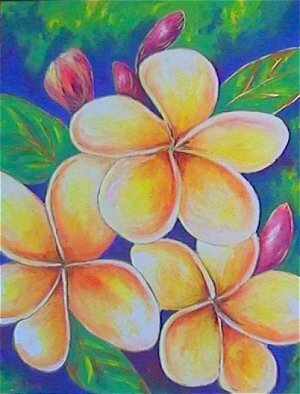 Plumeria Kimo has a strong, floral sweet, fruity spicy fragrance.